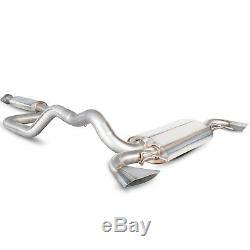 SVXS057 - Scorpion Car Exhaust Secondary Cat-Back System (Non-Resonated) Special - Vauxhall Astra J VXR 2012 - Current. The UK's No 1 Motorcycle & Motorcross Accessories Store. View All Parts & Spares. Parts & Spares > Exhausts, Air & Fuel System. Usually Dispatched Within 5 days (Mon-Fri). The Scorpion Car Exhaust Secondary Cat-Back System (Non-Resonated) - Vauxhall Astra J VXR 2012 - Current is part of the latest Scorpion Exhausts collection. The latest VXR is pretty awesome in standard trim however the Scorpion development engineers have been busy to improve on this. This time coming up with a 76mm/3 half system with either resonated or none esonated centre section. This is further expandable to include a downpipe fitted with Sports Catalyst. The sports cat is a 200 cell high flow unit. A de-cat downpipe is a further option. A catalyst is a key component in emission control. It is also the most restrictive component of an exhaust. Our sports catalysts increase the gas flow while maintaining filtration rates. Our de-cats simply replace the catalyst altogether for the ultimate flow rate. Red Power Valve - No. All Scorpion Exhausts are designed to have increased performance over OEM systems. All Scorpion Exhausts are designed and manufactured in the UK by skilled and experienced engineers. All Scorpion car products are guaranteed for life. All Scorpion products are supplied with everything needed to fit and drive, along with parts drawings and picture instruction where necessary. All Scorpion exhausts are hand crafted by Scorpion automotive engineers in Derbyshire, UK. Your package will include the following. 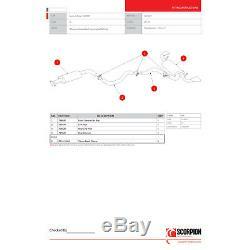 SVXS057 - Scorpion Car Exhaust Secondary Cat-Back System (Non-Resonated) - Vauxhall Astra J VXR 2012 - Current, consisting of. PLEASE NOTE: Most Scorpion Exhausts are standard Stock, and will be with you in a few days, but some are a bespoke item, manufactured to order. Due to high order volumes there may sometimes be a delay in the production of your exhaust. If you require an exhaust for a specific date, please order well in advance to ensure that you receive it in good time. We appreciate your understanding in this matter. For over a decade Scorpion Exhausts have been recognised and sought after by leading tuning specialists all over the world. Their innovative approach to design, use of high specification materials and state-of-the-art manufacturing facilities ensure a truly world class product that is guaranteed. The Scorpion Red Power Car Exhausts are packed with features.. 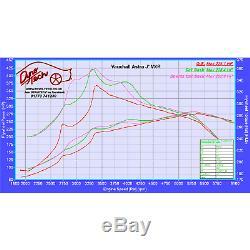 Designed specifically for the Vauxhall Astra J VXR 2012 - Current. This product has no reviews yet, however see what our buyers say about our other products..
To maintain our service we only select the market leading couriers to deliver our orders. Same Day Dispatch, Monday - Friday. A select few items may have a longer lead time as they may be specially ordered from our manufacturers. From July 1st 2017, UK Good Deals Ltd can accept orders from most countries. These charges must be paid by the recipient of the parcel (this applies to both retail and wholesale customers). We want to give you a hassle-free way to return anything, either as a UK or an International customer. We want you to be totally satisfied with your order, so if for any reason its not suitable we are here to help. HOW DO I RETURN AN ITEM(S)? RETURNING A PARCEL FROM WITHIN THE UNITED KINGDOM. When an item is Faulty. If you item is faulty, you may qualify for a pre-paid label, please contact our customer service team before you return your item for the best way to proceed. If you do not qualify for a free return you can simply send the item back to us via your preferred method, however we do recommend you use a traceable service so that you can track your items. (Only 1 free return per order). In most cases if you qualify for a Free Return a return label will be sent with your order for your to use. If a label is not provided, don't worry you can print the label of here. And return the item to the address above. Once the item arrives back at our warehouse, a member of our customer service team will contact you within 24hrs to discuss the return. And we will be happy to assist you further. During festive and sales periods this may be extended slightly. Sign up for our latest News & offers. The item "Scorpion Exhaust Secondary Cat-Back System Vauxhall Astra J VXR 12+ Aftermarket" is in sale since Monday, February 27, 2017. This item is in the category "Vehicle Parts & Accessories\Car Tuning & Styling\Performance Exhaust\Complete Performance Exhausts". The seller is "ghostbikes_uk" and is located in Preston.